Hot on the heels of the ripples caused across the country by the screening of Blue Planet, the UK is slowly becoming more in-tune and aware of the plastic problem that we’re currently facing, both on land and at sea. A less well-known culprit, but still a huge part of the problem is the plastic drinking straw. According to the stats cited by Clean Water Action, these little fellows are used 500 million times A DAY in the US alone; that’s a whole heap of plastic. You may have already come across one of the stories that has helped keep the drinking straw on the agenda; a viral video on the internet of a distressed turtle with a plastic straw stuck up its nose. This particular video has already been viewed over 21 million times and highlights just how much damage this small piece of tubular plastic can do. Marine biologists in Costa Rica were horrified to discover the endangered Olive Ridley sea turtle on a research trip at sea in Costa Rica. At first, they thought it was some kind of burrowing marine parasite protruding from the nostril, but discovered after pulling it out of the turtle’s nose that it was, in fact, a plastic drinking straw. They only had a Swiss Army Knife onboard so had to resort to using it in the extraction process. The green sea turtle was clearly distressed during the 8-minute ordeal, which left it bleeding for some time afterwards. The bleeding stopped shortly afterwards and the nostril was disinfected with iodine before the researchers deemed it safe to release the turtle back into the ocean. Many big-name companies are finally beginning to address the plastic straw issue with a few workable alternatives. Wetherspoons Pubs have scrapped plastic straws altogether whilst Costa Coffee have pledged to remove them from their shops altogether and replace them with biodegradable ones instead. This announcement follows in the footsteps of other big brands including Wagamama and Pret a Manger who have also pledged to dramatically reduce plastic straw usage in their shops. Supermarket giants Waitrose have announced that they will stop selling them altogether soon whilst Iceland have gone a step further and said that they will remove all plastic from their own-brand products within the next five years. We already face a huge plastic problem; we’ve produced 8.3 billion tonnes of the stuff since the 1950s. Aside from the amount already in landfill and bobbing around in the ocean, there are an estimated five trillion pieces of microplastic in our seas worldwide, wreaking havoc with marine life. It’s worth bearing in mind that since plastic takes hundreds of years to degrade, every plastic drinking straw ever produced is still with us in one form or another today. Considering that their use in our drinks only lasts for a few minutes at a time before we chuck them away, it’s a sad indictment of our throw-away mentality. An obvious first step is to refuse the option for a straw at fast food outlets, coffee shops, bars and pubs etc. If you choose not to use one even if they’re available, you’re already making a start. You can of course also extend this to refusing to use disposable plastic cutlery, and ask for a metal alternative instead. Whilst some may consider it either impractical or a step too far, you can also opt to carry around your own cutlery if you’re really committed to making a difference, and also lead by example. Whilst you may think that paper straws are counter-intuitive as they’ll go all soggy after a few minutes, this isn’t the case with ones that are now available on the market. If you check them out on Amazon, you’ll see that they get pretty good reviews and a relatively inexpensive for a large pack. We have to add that the retro red and white barber’s striped ones look pretty funky too! We can vouch for these first hand (the author of this blog actually has one). As long as you don’t keep dropping it on concrete or throwing it against a wall, these ones will last indefinitely and can easily be carried around for daily use. 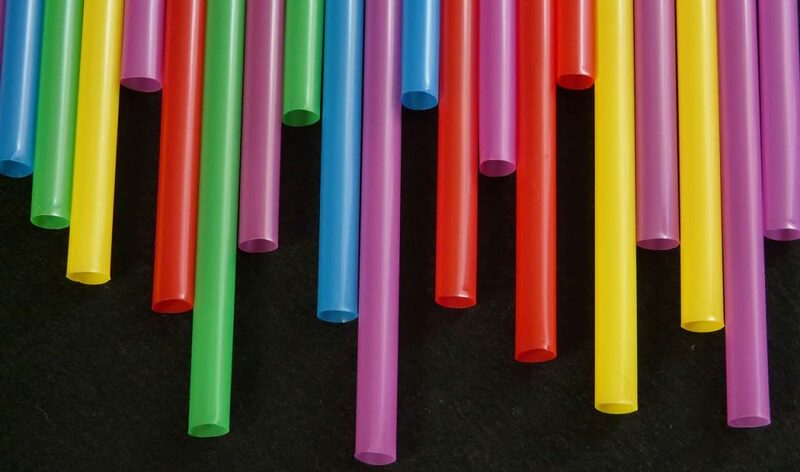 Plastic straws are made from petroleum and contain all sorts of nasty chemicals, both in the plastic itself and the colouring used during its manufacture. A glass straw is a much healthier (and cheaper in the long run) alternative. You can even get super durable ones made from borosilicate, which is really strong, dishwasher safe and similar to Pyrex glass. There are plenty of other options too. If you want something that really is going to be mega durable, you can now get ones made from titanium. Head on over to Ecostrawz to see their full range, which also includes straws made from bamboo, stainless steel and natural wheat. If you still want other ideas for biodegradable options, Drinkstuff will be happy to sell you some nifty, bendy plastic-like ones instead. These will naturally break down over the course of a few months once they’ve come into contact with heat, moisture or bacteria. They’re made from polypropylene (a kind of biodegradable plastic), and are surely a better alternative to their non-biodegradable relatives.